I can feel spring! I know I woke up with snow on the ground this morning but looking at the 10 day outlook for our weather with most of our temperatures being over 45 degrees it's definitely spring! I'm looking forward to planting flowers and hanging up our bird feeders and just being outside! Home Depot's Kid Workshop for April is perfect for helping me with this and it can make my daughter feel like she's part of it too! 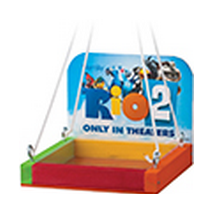 Your kids can create a Bird Bath/Bird Feeder based on the movie Rio 2! You can register for it now and then head to Home Depot on April 5th between 9am-Noon! Click on the picture below to register!